Isn’t fall a wonderful time of year. I enjoy doing family things and going away with my hubby and planning some girl time too! I have a list of some events going on this month. If you know of any others, please send them my way so we can add it to the list. Any couples looking for a getaway? Meadowmere Resort in Ogunquit, Maine is one of our favorites! Close to the beautiful Marginal Way, dining and shops. The resort has everything from pools, even a Roman Spa, to a movie theater. Great for family or an adult getaway offering traditional rooms to honeymoon suites. 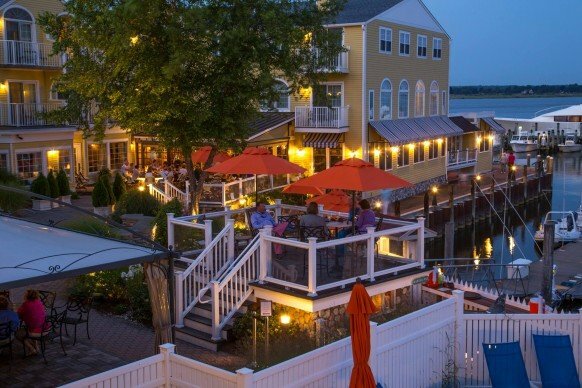 Saybrook Point Inn & Spa in Saybrook, Ct. (photo above) My favorite inn in New England! They have wood burning fireplaces in most rooms, an amazing restaurant and they even have a lighthouse suite. Though I’ve seen families here, I prefer this spot as my special getaway with my hubby or a girls getaway! Fall Fairs & Festivals—-we have a giveaway going on for one of these great fairs. Make sure to check it out!!!!! Another great idea of things to do is rent a bouncy house for your family or with the neighborhood! HERE are a couple rentals companies for you to check out. Sept 17th-Oct 15th: ANHEUSER-BUSCH TOUR CENTERS TRANSFORM INTO MUNICH FOR SECOND ANNUAL OKTOBERFEST:Guests of all ages are welcome to attend Oktoberfest. The Tour Centers will host games, like barrel rolling and stein relays, on select weekends, as well as German dancers and live music throughout the month-long celebrations. Oktoberfest attire is welcomed and admission is complimentary. For more information about Anheuser-Busch Oktoberfest and local event details, visit BudweiserTours.com. Sept 24th: Seacoast Center Bioblitz! I strongly recommend this! Our family has gone to several of these, it’s an amazing program! Sept 25th: Join The Friends of the Rollinsford Public Library for the annual Salmon Run 5K and Kids Fun Run. All proceeds go to the Rollinsford Public Library to support community programs and events. « WOW! Six Flags Season Pass 71% Off and can use it this year! One Response to September Calendar of Fun!! !